There are ages of faith which leave their traces in splendour and beauty, as acts of piety and memory. East Anglia is full of silent witnesses to tides which have ebbed and flowed. Receding, they leave us in their wake great works from the passing ages, little Norman churches which seem to speak a language we can no longer understand but which haunts us still, the decorated beauty of the 14th Century at odds with the horrors of its pestilence and loss, the perpendicular triumph of the 15th Century church before its near-destruction in the subsequent Reformation and Commonwealth, the protestant flowering of chapels and meeting houses in almost all rural communities, and most obvious of all for us today the triumphalism of the Victorian revival. But even as tides recede, piety and memory survive, most often in quiet acts and intimate details. 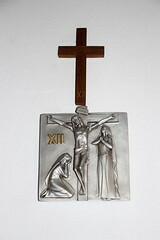 The catholic church of Holy Family and St Michael at Kesgrave is one of their great 20th Century treasure houses. At the time of the 1851 census of religious worship, Kesgrave was home to just 86 people, 79 of whom attended morning service that day, giving this parish the highest percentage attendance of any in Suffolk. 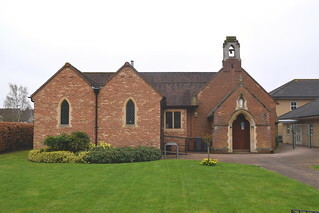 However, they met half a mile up the road at the Anglican parish church of All Saints, and the current site of Holy Family was then far out in the fields. In any case, it is unlikely that any of the non-attenders was a Catholic. Today, Kesgrave is a sprawling eastern suburb of Ipswich, home to about 10,000 people. It extends along the A12 corridor all the way to Martlesham, which in turn will take you pretty much all the way to Woodbridge without seeing much more than a field or two between the houses. 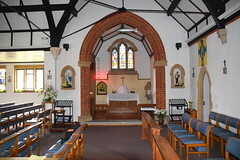 Holy Family was erected in the 1930s, and serves as a chapel of ease within the parish of Ipswich St Mary. However, it is still in private ownership, the responsibility of the Rope family, who, along with the Jolly family into which they married, owned much of the land in Kesgrave that was later built on. 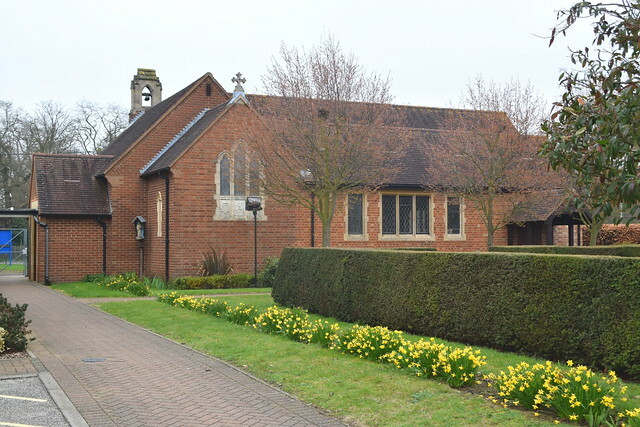 The growth of Kesgrave has been so rapid and so extensive in these last forty years that radical expansions were required at both this church and at All Saints, as well as to the next parish church along in the suburbs at Rushmere St Andrew. All of these projects are interesting, although externally Holy Family is less dramatic than its neighbours. It sits neatly in its trim little churchyard, red-brick and towerless, a harmonious little building if rather a curious shape, of which more in a moment. Beside it, the underpass and roundabout gives it a decidedly urban air. But this is a church of outstanding interest, as we shall see. It was good to come back to Kesgrave. As a member of St Mary's parish I generally attended mass at the parish's other church, a couple of miles into town, but I had been here a number of times over the years, either to mass or just to wander around and sit for a while. These days, you generally approach the church from around the back, where you'll find a sprawling car park typical of a modern Catholic church. To the west of the church are Lucy House and Philip House, newly built for the work of the Rope family charities. Between the car park and the church there there is a tiny, formal graveyard, with crosses remembering members of the Rope and Jolly families. Access to the church is usually through a west door these days, but if you are fortunate enough to enter through the original porch on the north side you will have a foretaste of what is to come, for to left and right are stunning jewel-like and detailed windows depicting St Margaret and St Theresa on one side and St Catherine and the Immaculate Conception on the other. 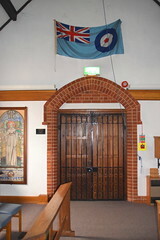 Beside them, a plaque reveals that the church was built to the memory of Michael Rope, who was killed in the R101 airship disaster of 1930. Blue Peter-watching boys like me, growing up in the 1960s and 1970s, were enthralled by airships. They were one of those exciting inventions of a not-so-distant past which were, in a real sense, futuristic, a part of the 1930s modernist project that imagined and predicted the way we live now. And they were just so big. But they were doomed, because the hydrogen which gave them their buoyancy was explosive. As a child, I was fascinated by the R101 airship and its disaster, especially because of that familiar photograph of its wrecked and burnt-out fuselage sprawled in the woods on a northern French hillside. It is still a haunting photograph today. The crash of the R101 put an end to airship development in the UK for more than half a century. 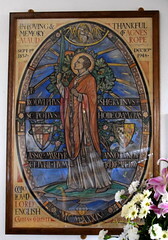 Of course, this is all ancient history now, but in the year 2001 I had the excellent fortune to be shown around Holy Family by Michael Rope's widow, Mrs Lucy Doreen Rope, née Jolly, who was still alive, and then in her nineties. She was responsible for the building of this church as a memorial to her husband. We paused in the porch so that I could admire the windows. "Do you like them?" Mrs Rope asked me. "Of course, my sister-in-law made them." 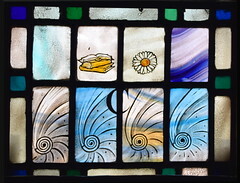 Her sister-in-law, of course, was Margaret Agnes Rope, who in the first half of the twentieth century was one of the finest of the Arts and Craft Movement stained glass designers. She studied at Birmingham, and then worked at the Glass House in Fulham with her cousin, Margaret Edith Aldrich Rope, whose work is also here. 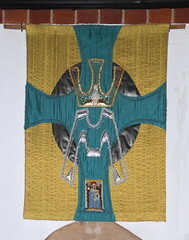 But their work can be found in churches and cathedrals all over the world. What Mrs Rope did not tell me, and what I found out later, is that these two windows in the porch were made for her and her husband Michael as a wedding present. Doreen Jolly and Michael Rope were married in 1929. Within a year, he was dead. Mrs Rope was just 23 years old. 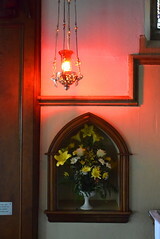 The original church from the 1930s is the part that you step into. 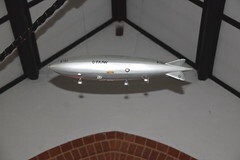 You enter to the bizarre sight of a model of the R101 airship suspended from the roof. The nave altar and tabernacle ahead are in the original sanctuary, and you are facing the liturgical east (actually south) of the original building, and what an intimate space this must have been before the church was extended. 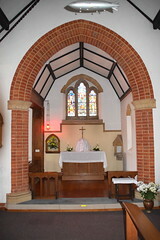 Red brick outlines the entrance to the sanctuary, and here are the three windows made by Margaret Rope for the original church. 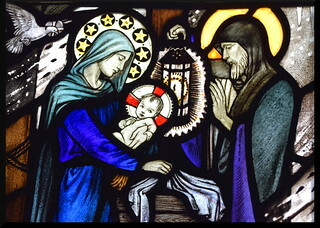 The first is the three-light sanctuary window, depicting the Blessed Virgin and child flanked by St Joseph and St Michael. Two doves sit on a nest beneath Mary's feet, while a quizzical sparrow looks on. St Michael has the face of Michael Rope. 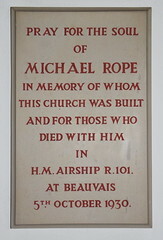 The inscription beneath reads Pray for Michael Rope who gave up his soul to God in the wreck of His Majesty's Airship R101, Beauvais, October 5th 1930. 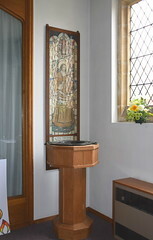 Next, a lancet in the right-hand side of the sanctuary contains glass depicting St Dominic. A dog runs with a burning brand beneath his feet through the inscription Laudare, Benedicere, Praedicare, ('to praise, to bless, to preach'). 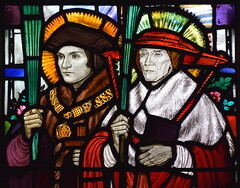 The third window is in the west wall of the church (in its day, the right hand side of the nave), depicting St Thomas More and St John Fisher, although at the time the window was made they had not yet been canonised. 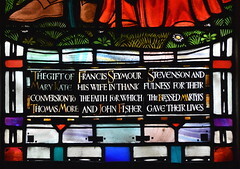 The inscription beneath records that the window was the gift of a local couple in thankfulness for their conversion to the faith for which the Blessed Martyrs Thomas More and John Fisher gave their lives. A rose bush springs from in front of the martyrs' feet. 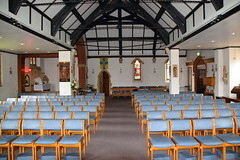 By the 1950s, Holy Family was no longer large enough for the community it served, and it was greatly expanded to the east to the designs of the archtect Henry Munro Cautley. 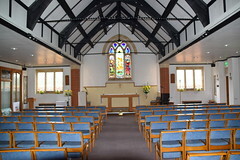 Cautley was a bluff Anglican of the old school, the retired former diocesan architect of St Edmundsbury and Ipswich, but he would have enjoyed designing a church for such an intimate faith community, and in fact it was his last major project before he died in 1959. The original sanctuary was retained as a blessed sacrament chapel, and the church was turned ninety degrees to face east for the first time. The north and south sides of the new church received three-light Tudor windows in the style most beloved by Cautley, as seen also at his Ipswich County Library in Northgate Street, and the former Fosters (now Lloyds) Bank in central Cambridge. Although the Rope family had farmed at Blaxhall near Wickham Market for generations, Margaret Rope herself was not from Suffolk at all, and nor was she at first a Catholic. She was born in Shrewsbury in 1882, the daughter of Henry Rope, a surgeon at Shrewsbury Infirmary, and a son of the Blaxhall Rope family. 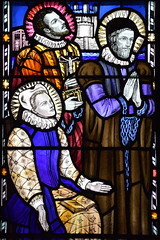 The largest collection of Margaret Rope's glass is in Shrewsbury Cathedral. When Margaret was 17, her father died. The family were received into the Catholic church shortly afterwards. 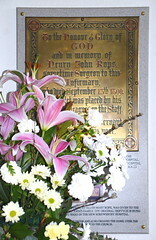 A plaque was placed in the entrance to Shrewsbury Infirmary to remember her father. 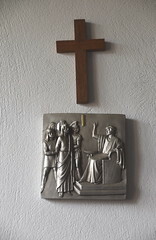 When the hospital was demolished in the 1990s, the plaque was moved to here, and now sits in the north aisle of the 1950s church. 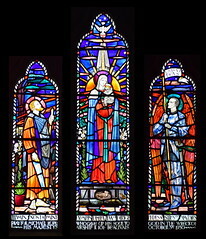 In her early days in London Margaret Rope designed and made the large east window at Blaxhall church as a memorial to her grandparents. 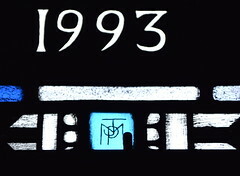 It features her younger brother Michael, and is believed to be the only window that she ever signed. 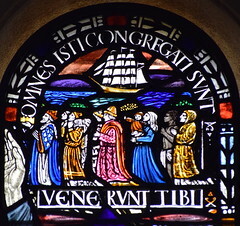 In her early forties, Margaret Rope took holy orders and entered the Carmelite Convent at nearby Woodbridge, but continued to produce her stained glass work until the community moved to Quidenham in Norfolk, when poor health and the distances involved proved insurmountable. She died there in 1953, and so she never saw the expanded church. Her cartoons, the designs for her windows, are placed on the walls around Holy Family. 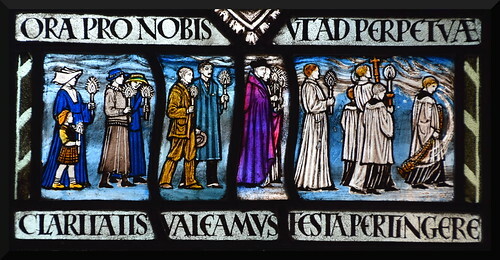 Some are for windows in churches in Scotland and Wales, one for a window in the English College in Rome. 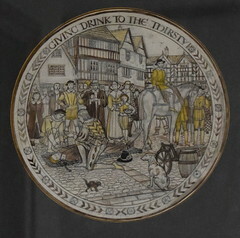 Among them are the roundels for within the enclosure of Tyburn Convent in London. "They had to remove the windows there during the War", said Mrs Rope. "Of course, with me, you have to ask which war!" 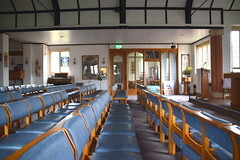 Turning to the east, we see the new sanctuary with its high altar, completed in 1993 as part of a further reordering and expansion, which gave a large galilee porch, kitchen and toilets to the north side of the church. 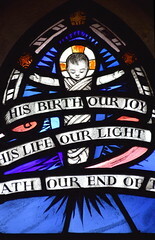 The window above the new sanctuary has three lights, and the two outer windows were made by Margaret Rope for the chapel of East Bergholt convent to the south of Ipswich. 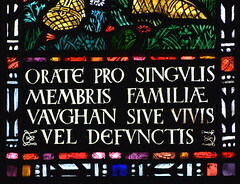 They remember the Vaughan family, into which Margaret Rope's sister had married, and in particular one member, a sister in the convent, to celebrate her 25 year jubilee. The convent later became Old Hall, a famous commune. 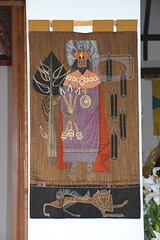 The panels depict the prophet Isaiah and King David. The central light between them is controversial. Produced in the 1990s and depicting the risen Christ, it really isn't very good, and provides the one jarring note in the church. It is rather unfortunate that it is in such a prominent position. It is not just the quality of the design that is the problem. It lets in too much light in comparison with the two flanking lights. "The glass in my sister-in-law's windows is half an inch thick", Mrs Rope told me. "In the workshop at Fulham they had a man who came in specially to cut it for them". The glass in the modern light is simply too thin. Despite the 1990s extension, and as so often in modern urban Catholic churches, Holy Family is already not really big enough, although it is hard to see that there could ever be another expansion. 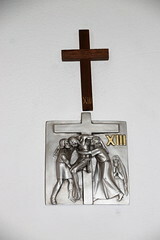 We walked along Munro Cautley's south aisle, and at that time the stations of the cross were simple wooden crosses. However, about three months after my conversation with Mrs Rope, the World Trade Centre in New York was attacked and destroyed, and among the three thousand people killed were two local Kesgrave brothers who were commemorated with a new set of stations in cast metal. 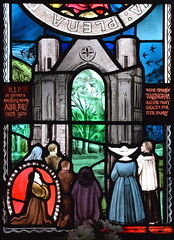 Here also is a 1956 memorial window by Margaret Rope's cousin, Margaret Edith Aldrich Rope, to Mrs Rope's mother Alice Jolly, depicting the remains of the shrine at Walsingham and the Jolly family at prayer before it. 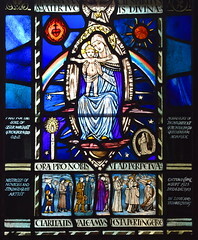 Another MEA Rope window is across the church in the galilee, a Second World War memorial window, originally on the east side of the first church before Cautley's extension. 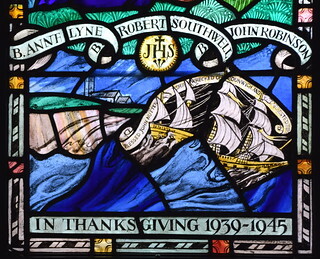 It depicts three of the English Martyrs, Blessed Anne Lynne, Blessed Robert Southwell and Blessed John Robinson, as well as the shipwreck of Blessed John Nutter off of Dunwich, with All Saints church on the cliffs above. The galilee is designed for families with young children to play a full part in mass, and is separated from the church by a glass screen. 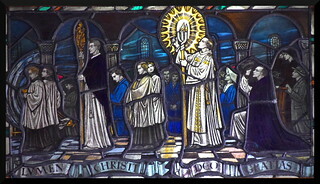 At the top of the screen is a small panel by Margaret Rope which is of particular interest because it depicts her and her family participating in the Easter vigil, presumably in Shrewsbury Cathedral. This is hard to photograph because it is on an internal window between two rooms. A recent addition to the Margaret Edith Aldrich Rope windows here is directly opposite, newly installed on the south side of the nave. 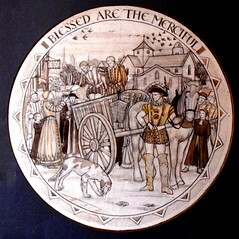 It was donated by her great-nephew. 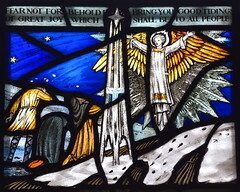 It depicts a nativity scene, the Holy Family in the stable at Bethlehem, an angel appearing to shepherds on the snowy hills beyond. It is perhaps her loveliest window in the church. Finally, back across the church. 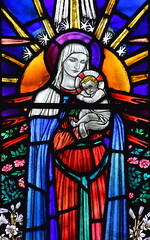 Here, beside the brass memorial to Henry Rope, is a window depicting the Blessed Virgin and child, members of the Rope family in the Candlemas procession beneath. 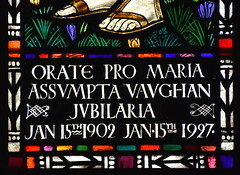 The inscription reminds us to pray for the soul of Sister Margaret of the Mother of God, mistress of novices and stained glass artist, Monastery of the Magnificat of the Mother of God, Quidenham, Norfolk, entered Carmel 14th September 1923, died 6th December 1953. Sister Margaret of the Mother of God was, of course, Margaret Rope herself. She was buried in the convent at Quidenham, a Shrewsbury exile at rest in the East Anglian soil of her forebears. 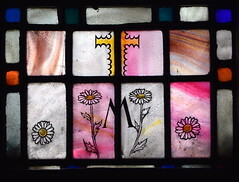 Margaret Rope had made the main body of this window herself, as a present for her mother. 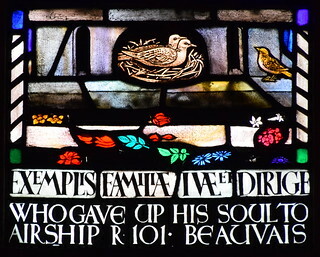 After passing into the hands of her sister, the window was then used as her memorial, the outer panels with the inscription added by her cousin Margaret Edith Aldrich Rope. 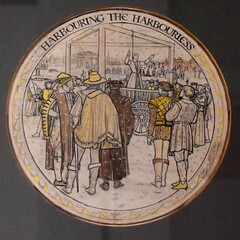 Intriguingly, Margaret Rope's great-nephew Arthur Rope has suggested to me that her cousin also replaced the small kneeling figure panel bottom right, which in Margaret Rope's cartoon for the window depicts a self-caricature. As he points out, the figure there now looks very much like the nun kneeling on Margaret Edith Aldrich Rope's later memorial to Alice Jolly across the church. Back in 2001, we were talking about the changing Church, and I asked Mrs Rope what she thought about the recently introduced practice of transferring Holy Days on to the nearest Sunday, so that the teaching of them was not lost. Mrs Rope approved, a lady clearly not stuck in the past. She had a passion for ensuring that the Faith could be shared with children. As we have seen, her church is designed so that young families can take a full part in the Mass. But she was sympathetic to the distractions of the modern age. "The world is so exciting for children these days", she said. "I think it must be difficult to bring them up with a sense of the presence of God." She smiled. "Mind you, my son is 70 now! And I do admire young girls today. They have such spirit!" And so this grand old lady left me to potter about in her wonderful treasure house. As I did so, I thought of medieval churches I have visited, which were similarly donated by the Mrs Ropes of their day, perhaps even for husbands who had died young. They not only sought to memorialise their loved ones, but to consecrate a space for prayer, that masses might be said for the souls of the dead. This was the Catholic way, a Christian duty. Before the Reformation, this was true in every parish in England. It remained true here at Kesgrave. One of the great losses to the Church of England is the practice of praying for the souls of the dead, anathematised at the Reformation, and now encouraged in only a few Anglican parishes. Prayers for our lost loved ones bound our communities together, the past with the present, the living and the dead. 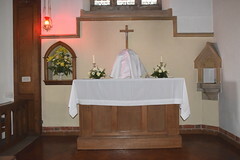 Today, all over the land, many Anglican congregations are shrinking, and yet on the soft ground around their churches the locals enact a pagan cult of the dead, worshipping their recent ancestors with propitiatory flowers, often unable to combine this act with a prayer said inside a sacred building, increasingly unaware that such a thing might even be appropriate. It seems a shame. And so, finally, back outside to the small graveyard of Holy Family. Simple crosses line the low yew hedging, as if this were a convent cemetery. Side by side are two particular crosses. 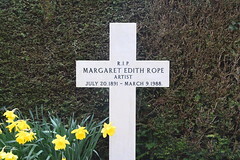 One remembers Margaret Edith Aldrich Rope, artist, 1891-1988. 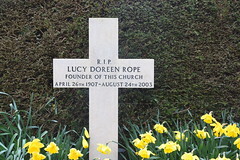 The other remembers Lucy Doreen Rope, founder of this church, 1907-2003.